By act of the US Congress, on July 1, 1891 the duties of the Signal Service weather bureau were transferred to the US Weather Bureau under the Department of Agriculture. ​The first Chief of the Weather Bureau in 1891 was Mark W Harrington (1848-1926). Harrington had served as a professor of astronomy in Peking, China and at the University of Michigan and had been director of the Detroit Observatory for 12 years where he focused on meteorology. He founded the American Meteorological Journal in 1884. The first use of kites to record temperature aloft occured in 1894 during his term as chief. ​In addition, first order stations generally had one double or triple register for recording wind and rain, one photographic sunshine recorder, one thermometric sunshine recorder, one electrically recording rain gauge, one electrically recording weighing rain and snow gauge, one aneroid Richard's barograph, one Richard's thermograph, and one Richard's thermograph recording electrically at a distance. Most minor stations reported temperature and wind velocity only. At most stations, a standard instrument shelter near the ground was used. In larger cities, it was considered more important to be near telegraph and newspaper offices and the weather instruments were often located atop buildings. Tabulation and maps of US tornadoes for 1889-1896 appeared in the 1895-1896 report of the Chief of the Weather Bureau. 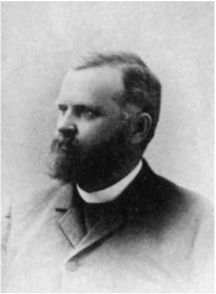 Harrington was removed from office as chief in 1895 due to concerns over his management, but remained with the Weather Bureau until retiring in 1899. He disappeared shortly thereafter and was placed in a mental institution as John Doe in 1907 where he remained for the rest of his life. 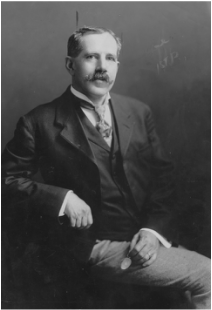 Harrington was succeeded as chief in July 1895 by Willis L Moore (1856-1927). In 1876 Moore entered the Signal Service weather bureau as a young trainee and was subsequently a forecaster in Milwaukee and Chicago. He ultimately was a Weather Bureau professor of meteorology, an honorary member of the Royal Meteorological Society, and was president of the National Geographic Society. A great publicizer of meteorology, in 1910 Moore authored the book 'Descriptive Meteorology' which was widely distributed. In September 1895 the telegraphic distribution of wet bulb temperature was added by the Weather Bureau. ​​The first five Atlantic hurricane warnings were issued in 1895. In 1898 the Weather Bureau established a hurricane warning network in the Caribbean. Experiments in wireless telegraphy (radio) were started in January 1900, initially under the direction of Canadian inventor Reginald Fessenden. Beginning in 1905, wireless weather reports from ships at sea were received. In 1902 there were 124 observing stations "fully equipped with automatic instruments recording wind velocity and direction, the temperature and the pressure of the air, and the duration of sunshine and rainfall. 105 of these 124 stations had additional recording registers and additional instrumentation. 145 stations were telegraphing two observations per day. ​In 1904, the use of airplanes for upper air research was begun and in 1909 a program of free rising balloon observations was started. 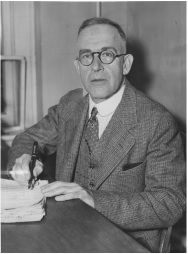 Cleveland Abbe was placed in charge of upper air research. Much of the research was performed at the Weather Bureau's Mount Weather Observatory in Virginia. In general, forecasts were telegraphed out within 2 or 3 hours of the observations having been made. In 1901, three day forecasts were begun for the North Atlantic. Under Moore, the first experimental weekly forecasts began in 1908 and a weekly general 'weather outlook' became a regular feature in 1910. In larger cities, weather forecasts and warnings could be obtained through the local telephone exchange. ​Moore was removed from office by President Woodrow Wilson in April 1913 amid charges of misuse of power. He was accused of organizing a campaign to have himself appointed Secretary of Agriculture in the Wilson cabinet. Charles F Marvin (1858-1943) became Chief of the US Weather Bureau in August 1913, a position he held until his retirement in 1934. Marvin started with the Signal Service in 1884 as a 'junior professor'. He became head of the instrumentation division in 1888. He was appointed a professor of meteorology in the Weather Bureau when it was created in 1891, and continued as chief of the instrumentation division. He designed, improved and constructed many meteorological instruments, many of which were used by the Weather Bureau. He also experimentally determined humidity tables which were published by the Weather Bureau in 1900 and became the standard table in the US for much of the 20th century. He was knighted by the King of Norway for meteorological assistance given to Amundsen's arctic expeditions. The first distribution of weather forecasts by radio occurred in 1914 in North Dakota and in 1915 in Illinois. In 1915 there were 199 principal observing stations providing reports by telegraph. In addition, observations were made at over 4,500 locations by unpaid cooperative observers. World War I placed special demands on the Weather Bureau, which were met despite loss of personnel to the military and other war work. Many of the staff entered military service, while others left the Weather Bureau for higher paying war industry jobs. Flying weather forecasts were first issued in July 1919 for the benefit of Army, Navy, and Post Office aviation. By 1921, daily upper air observations by kite were generally performed at six stations. Twice-daily pilot balloon observations of wind conditions were also performed at thirteen stations. In 1926 the Air Commerce Act directed the Weather Bureau to provide weather services for civilian aviation. In 1931 the Weather Bureau began daily upper air observations to 16,000 feet by aircraft at Chicago, Cleveland, Dallas and Omaha. Kite observations began to be phased out. Aviation airways were set up by the Department of Commerce, which led the Weather Bureau in new directions. By 1934 20 aircraft sounding stations were in operation. One of the greatest influences during Marvin's term in office was the growing importance of the Norwegian cyclone model as developed by Vilhelm Bjerknes at the Bergen School of Meteorology. The model introduced the concept of fronts separating air masses and was of great significance in improving weather forecasting. ​In 1928 the teletype replaced the telegraph as the primary means of reporting weather information. The advent of radio broadcasting in the 1920s provided a new avenue for the distribution of weather reports and forecasts. Advances in radio also increased the reception of weather data from international sources and ships at sea. Charles F Marvin retired in 1934 after 50 years of service to the Signal Service weather bureau and US Weather Bureau. The new chief of the Weather Bureau was Willis L Gregg, who had joined the Weather Bureau in 1915. His term in office was short, as he died in September 1938. Perhaps Gregg's greatest legacy was the establishment of Hurricane Warning Centers in April 1935. The Weather Bureau had received complaints regarding the inadequacy and error of hurricane warnings. In response Weather Bureau offices in San Juan, New Orleans, and Jacksonville were assigned responsibility for hurricane forecasts in specific geographic areas. The system worked well in dealing with the disastrous September 1935 hurricane in the Florida keys. The Jacksonville warning center would be moved to Miami in 1941 to better coordinate their activities with military forecast centers. The Miami center would later become the National Hurricane Center. Also during Gregg's term in office, the first US Weather Bureau radiosonde sounding of the upper air was performed in 1937. Aircraft soundings would be phased out shortly thereafter. A nationwide radiosonde observation network was established in 1940, resulting in the issuance of upper air charts. The use of marine buoys for data collection began in 1935. In December 1938, President Franklin Roosevelt appointed Francis W Reichelderfer (1895-1983) as Chief of the Weather Bureau. He would serve in office until his retirement in 1963. His many achievements will be discussed in detail in the discussion of the Department of Commerce Years of the Weather Bureau. On June 30, 1940 the US Weather Bureau was transferred from the Department of Agriculture to the Department of Commerce. The primary reason for the transfer was the growing importance of aviation and the importance of meteorology to flying. In the US the aviation industry is regulated by the Department of Commerce. The next web page deals with the history of the Weather Bureau during the Department of Commerce years (1940-1970). US Weather Bureau Annual Reports from the Department of Agriculture years (1891-1939) may be downloaded here via Dropbox, courtesy the NOAA Central LibraryData Imaging Project.